If you've ever seen the killer legs of a competitive cyclist, then you should have a pretty good idea of what bicycling is going to do for your bottom half. While it's not quite the same as riding out there on the road, indoor cycling can help you tone up your legs, get in shape and, if you do it at least 150 minutes a week, keep you in compliance with the minimum exercise recommendations for all adults, according to the U.S. Department of Health & Human Services. When it comes to getting shapelier legs, a big part of the equation is reducing the fat that's surrounding your existing muscles. To do that, you have to do exercises that burn calories, which definitely can include riding an exercise bike. On average, a 155-pound person will burn about 260 calories in 30 minutes riding a stationary bike at a moderate pace. Since you have to create a deficit of 3,500 calories to lose 1 pound, working out on the bike at even that moderate pace will get you there over time. Upright bikes tend to help you burn more calories than recumbent bikes, since you're in a more reclined position in the recumbent. If you have back pain or other pain, don't let that stop you from choosing the recumbent over the upright, however, since the better choice is the one that you can do longer without pain. One of the primary functions of an exercise bike is to help you burn calories, but all that pedaling is also going to help you tone some of your muscles. Among the muscles that will get a workout are the quadriceps of your thighs, the hamstrings at the back of your upper legs, your calf muscles and your abdominals. 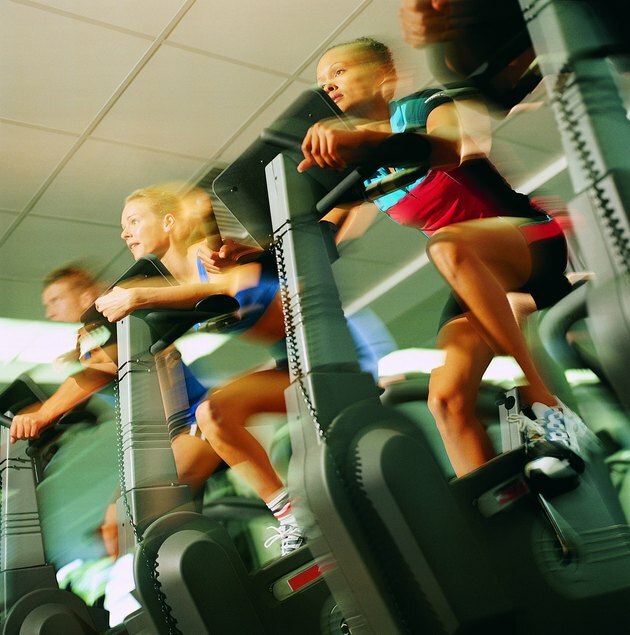 On an upright bike, you tend to use more of your upper-body muscles than on a recumbent. With an upright position, your legs' weight helps you move the pedals, making less work for your legs but more work for your trunk, which has to stabilize your body. When your legs work against resistance, they build muscle and help you get stronger and more toned. Simply pedaling on your exercise bike will do that, but you can also up the intensity in a few simple ways. The first and most obvious is to pedal faster. Another way to add intensity is to increase the resistance setting on the bike. Most exercise bikes come with a programmable computer that allows you to increase the tension on the pedals by simply pressing the "up" arrows. Also try a form of interval training in which the bike automatically moves from an "easy" resistance to a harder one every few minutes, simulating the workout you might get if you were climbing hills. Turning up the resistance knob will help you build muscle, but if you're really serious about creating tone and muscle definition, you'll need to incorporate strength training into your exercise routine. This can take many forms, from exercises using your own body weight to free weights to weight machines. Choose any type you like, but try to do two or three leg exercises for each muscle group, two days a week. For example, you might use free weights to do squats and lunges that work the hamstrings, glutes and quadriceps, and then move onto standing calf presses. You could then move onto the sled press to do lying calf presses and the quad press for the thighs. Variety is key, so try to mix up your routine every few weeks.